This entry is for Amir Soltani, a dear friend who helped whip up a hugely popular Iranian film festival out of thin air, and for his fabulous frequent collaborator Tina Hassannia, and for my kind and distinguished colleague Hamid Naficy. A group of men walk the curving road around a mountain, blackboards strapped to their backs. They look like biplanes. One man thanks the other for offering a cask of water. These could have been our dual protagonists, but the film opts otherwise. Unseen but audible aircraft overhead signal violent danger, and the itinerant teachers hide under their blackboards as rudimentary cover. They could have died, but they don't. Rising again, smearing their boards with camouflaging mud, the travelers reach a fork in their road. Most of them go one way, while two others, sensing menace along that path, take another. Who knows what happens to the larger passel of men. We only follow the dissenting pair, who in turn split off from each other, one clambering further up the mountain, the other easing his way down. We follow both. One doesn't make it. The other does, sort of. Either could easily have inherited the fate of the other. Blackboards, the least famous of the Iranian films that changed my life, austere in all respects, powerful as a gut-punch or a series of punches, negotiates multiple choicesthis way or that, this fellow or that, to marry or not, to teach or to quitwithin a larger circumstance where "choice" barely figures. Prospects seem woefully narrow along every circuitous route. The broadest quandary Blackboards describes is the utter strandedness of the Kurdish people, crossing back and forth over the Iran-Iraq border with no country to call their own and occasional confusions about where, exactly, they have arrived. Armed border patrols, poison gas, poverty, hunger, and precarious topography are only five of the ambient threats within both of the film's cross-cut storylines. The specific puzzle facing each protagonist, one absorbed into a group of elderly refugees, the other embedded in a skeptical band of pre-teen smugglers, is how to convince his new cohorts that they need an on-hand educator, and what value teaching could hold amid such dire conditions. Said (Said Mohamadi), one of the teachers, meets only one man who truly needs his help, an illiterate tender of grain who cannot read a letter from his son. Helpless with Arabic, Said semi-flippantly improvises a reassuring communiqué that comforts the aging father but also contradicts everything he knows about his child's life in Baghdad. Thus, in this linguistically and culturally eclectic region, the literate man struggles to offer the one thing a desperate acquaintance needs from him; the goals of information and solace seem deeply at odds. Meanwhile, whether a ten-year-old mule with contraband on his back and snipers on his tail has any need of writing, reading, or arithmetic is an almost rhetorical question. Then again, who can deny the thrill of seeing young Reeboir (Rafat Moradi) learning to spell and scrawl the name he shares with his wandering tutor (played by acclaimed filmmaker Bahman Ghobadi)? The elder Reeboir at least gets further plying his trade than Said does, though both men come to discover that their cumbersome blackboards are much more useful as protective covers, privacy screens, erstwhile gurneys, dowry contributions, even raw materials for impromptu splints than they are as teaching tablets. One of the boards bears the message "I love you" through the whole second half of the film, and even that sentiment starts to feel as incongruous, even pointless, as the object on which it is inscribed. To educate or not to educate, especially in conditions of dire emergency, is a lingering question in all three of director and cowriter Samira Makhmalbaf's first three films. In The Apple (1998), probably her best-known work, the un-socialized daughters of a Tehranian man and his blind, foreign-born wife are sprung from virtual captivity inside their home. Amid this ostensible victory, how and whether to teach these girls, versus how and whether to let them discover the wider world themselves, remains an unsettling issue. In Makhmalbaf's short film for the portmanteau 11'09"01 (2002), the toddlers in a refugee camp for Afghanis in northern Iran are unevenly aware and even somewhat blithe about the imminent anti-Taliban air raids which are terrifying the other residents. A lone female schoolteacher is determined to impart frameworks and ideas to these kids, helping them grasp their own circumstances and the losses suffered by far-off strangers, even as their parents are equally and understandably fixated on recruiting these moppets as brick-makers, so that last-minute bomb shelters might be built. In fact, though Blackboards premiered at Cannes over a year before September 11, 2001, winning one of two Jury Prizes that Samira Makhmalbaf had earned before turning 21 (but don't worry, I'm sure you're very accomplished, too), I didn't see it until after the Twin Towers fell and populations across the Middle East were shunted into new levels of fear and disarray. The historical and geographic epicenter of Blackboards falls earlier and elsewhere than the post-9/11 warzones of Baghdad and Afghanistan; the graduated fears around chemical poisoning and the invocations of Halabja place the action at the northern Iran-Iraq frontier, near the end of their mutual holocaust across the 1980s. Still, the filming strategies Makhmalbaf employed to suppress specific indicators of time and place in Blackboardsframing it as a floating allegory of ongoing pertinence, like Brecht's antiwar plays or Athenian tragediesmade it blisteringly evocative of region-wide anxieties, especially among the perpetually marooned Kurds, as warfare intensified under Bush and bin Laden. And this is a favorite film? you're asking, given this duly downcast sketch of plot and resonance. Well, yes. I have seen Blackboards almost a dozen times, arrested on every occasion by the brutal economy of its metaphors and its script, the haunting and escalating experiments in its sound design, and the frequent ellipticism in its editing, as well as its challenging ideas. Blackboards has the feeling of unfiltered reality but also of dramatically heightened parable. Its grip is so strong for 80 minutes that it's easy not to think about the sheer gutsiness of filming amid such a rugged, unforgiving landscape. Make no mistake, though, that Blackboards, among other things, is a peak achievement of taking cinema where it barely seems built to travel. Toting around a boom mike and a movie camera into rivers and across steep cliffsides, with dry shingles of ground giving way beneath actors' and artists' feet, raises as many questions of Why? and How? as brandishing a blackboard on your back in the same environment. Thus, even though Blackboards departs from the overt, elaborately nested metacinemas that made Iranian film world-famous in the 1990s, through works like Kiarostami's Close-Up and his Koker Trilogy, or the elder Makhmalbaf's Hello, Cinema and A Moment of Innocence, it's rigorously self-aware. (The challenging conditions of filming are starkly preserved in How Samira Made 'The Blackboards', directed by her teenaged brother Maysam, a full-length documentary included as a special feature on the out-of-print Wellspring DVD.) That sense of self-critique may be even keener if you are, like me, a teacher, and you're used to viewing your vocation as a self-evident good. Fair enough, yet we're sometimes forced to confront that everywhere from South Side Chicago to high-altitude Kurdistan, what you have to offer is what many people need but also what the same people, for formidable reasons, cannot for one dollar or one moment afford. 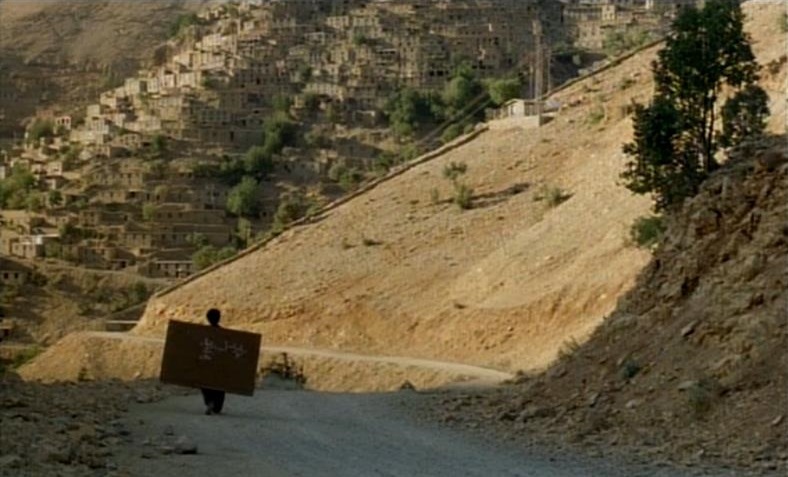 If Blackboards has any happy story to tell, its protagonist is Samira Makhmalbaf, who obviously benefited from her father's collaboration and resources, but who just as obviously operates from her own tenacious, distinctive, shape-shifting creativity. I don't know why her reputation among U.S. cinephiles never rose higher, or why all of her features struggled and often failed to secure even tiny U.S. releases after multiple Cannes laurels. So even Samira's is not an unqualifiedly happy story. It's also important not to canonize her personal temerity and artistic gumption in a way that feeds reductive views of youth or of Iran, as often happened in Apple- and Blackboards-era journalism, seemingly agog that this diminutive post-adolescent in a hijab was producing such galvanizing films. Why wouldn't she? you want to ask, on cultural and generational grounds, while also conceding her astonishing precocity and her commitment to visions as tricky and strong as Blackboards. I miss her voice and hope to hear it again soon. Beyond persisting as an emblem that anyone of any gender at any age from anywhere can summon something to say and the fortitude to say it unforgettably, Makhmalbaf personifies for me how dead-end conditions don't have to yield dead-end storytelling. No-exit plights can mobilize thought and attention, rather than prompting defeatism or guilt-soaked neglect. My affinity for Middle Eastern cinemas, very broadly construed, has only deepened and diversified in the years since Blackboards, but this distressing fable of foiled teaching furnished a formative lesson that's never left me.